Wood was one of the earliest materials that mankind learned to work with. Much softer than stone and requiring much less technology than metals, wood could be shaped into a wide variety of useful things from kitchen vessels and furniture to tools. Early woodworkers were very limited in the tools they had to work with because they had no metal to make those tools with. The only tools they had to use were made of stone. Yet, many specialty tools have been invented through the centuries – especially once metallurgy came to the fore. Tool manufacturers are still working today to design the next great breakthrough in tool technology. Today, the focus is on power tools – especially cordless power tools. Many amateur woodworkers do nothing if they can’t do it with a power tool. 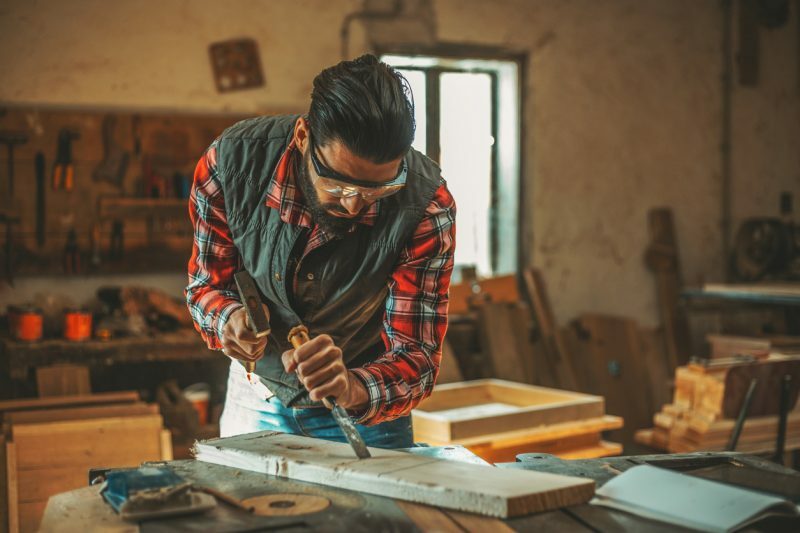 Paradoxically, it has all but come to the point where you can tell a woodworker’s level of expertise by their skill with these all-but-forgotten hand tools. Even so, many of these hand tools are extremely useful and make it easier to do things that are harder to do with power tools. Most people know what chisels are, but few are actually proficient in their use. Yet, the chisel has long been one of the more predominant wood-forming tools. If you are going to assemble furniture using mortise and tenon construction, the chisel is essential for making both parts. Larger chisels called “timber chisels” are used for preparing the notches on logs for log cabin homes. 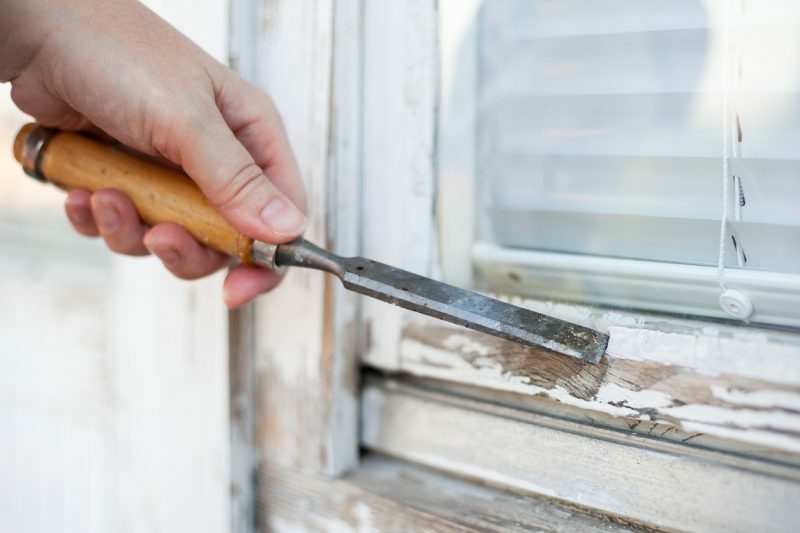 Today, the only use most people know of for chisels is for wood carving or opening paint cans. While they are still excellent for carving, I certainly wouldn’t want to mistreat mine and dull them by using them to open cans of paint. Carving is by far not the only thing that chisels are useful for. 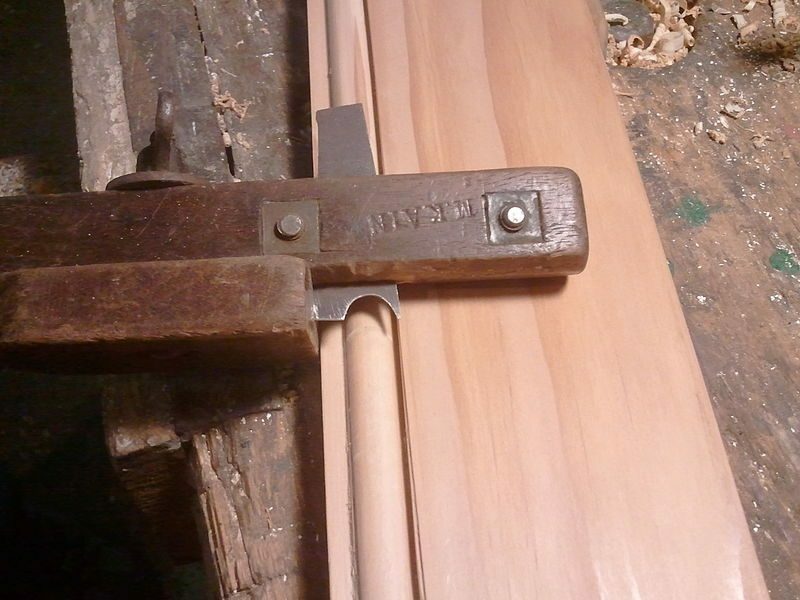 Most of us are familiar with a bit and brace, the most common manual drill of times gone by, but few people remember the gimlet – and no, I’m not talking about the giblets in gravy; rather, I’m talking about what is probably the most simple form of wood drill ever. Gimlets come in different sizes and are used for boring small holes into wood. They essentially look like a drill bit that has the back end extended into a T-key. I started using them a number of years ago and have found them more convenient when I need a quick hole or two than grabbing my cordless drill. Here’s another tool that almost everyone knows but few really know how to use. The plane has been the basic way of smoothing wood surfaces, after cutting, for centuries. They are much faster than sanding and can also be used to shape the wood somewhat, mostly by angling an edge or tapering a board slightly. Planes are also used for smoothing and leveling a surface when multiple boards are glued together to make a tabletop. In reality, there are a whole lot of things that planes can be used for once you master them. They even replace a router – or I should say that they were the router before the router existed. 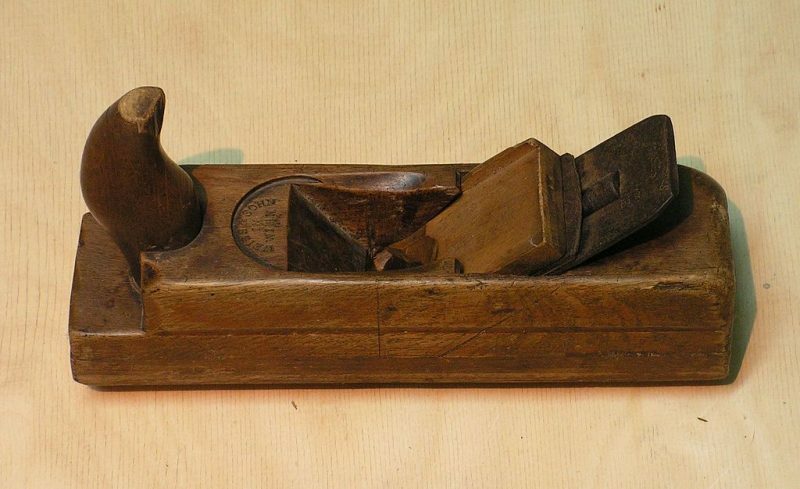 Cutting rabbets and making molding were two of the most common uses for specialty planes, which have been largely replaced by routers, but you can still find old molding planes at times, which work as well today as they did in the 1800s. Before sandpaper started becoming common in the 1800s, the scraper was the only way of smoothing the surface of a board. Essentially a flat piece of thin tool steel, the scraper is prepared by raising a burr on the edge with a special burnisher. This burr would scrape off the thinnest of shavings and smooth a surface more finely than a plane could do. In reality, the finish that a scraper can provide is even finer than that which even the finest sandpaper can provide because sandpaper leaves fibers sticking up out of the wood. In the case of open-grained woods like oak, these fibers will push down into the grain and impede the application of paste wood filler. Even on closed grain woods like maple, the fibers affect how smooth the finish is. 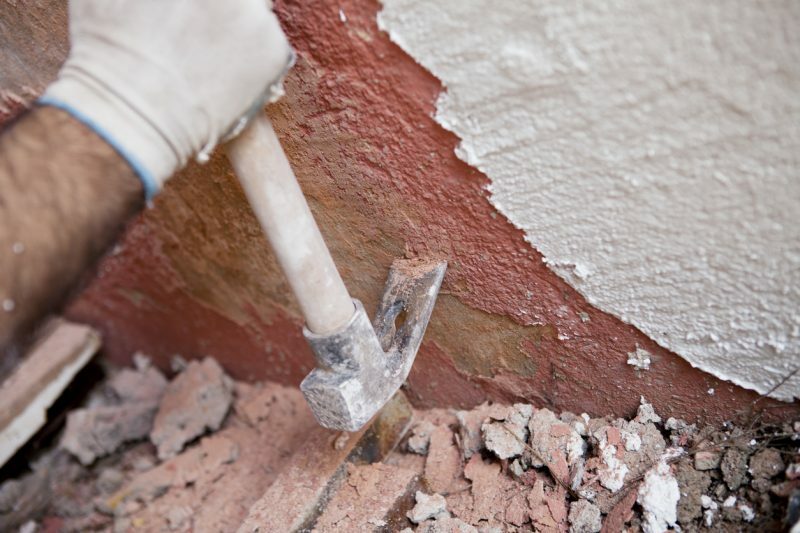 Due to the way the scraper works, it can also be used easily for removing old finish. When sandpaper is used in this manner it clogs up rapidly and you end up using lots of it, but a scraper can’t clog up. It takes time to get used to using a scraper, especially in raising the necessary burr. But it is worth the effort, especially if you want a really fine finish on your projects. The scratch stock was another tool that was used for creating moldings – usually in cases where only a small amount of molding was needed. Making specialty planes for architectural moldings is a fairly major project, so when a carpenter or cabinet maker needed only a small amount of molding, they would file a piece of flat metal to the contour and mount it in the scratch stock, which was little more than a T-handle. Dragging the metal across the wood repeatedly would carve the contour into the wood. 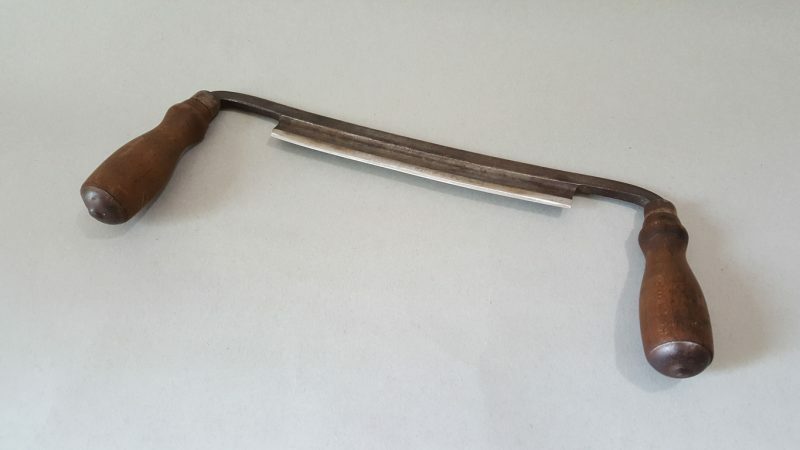 The drawknife was a specialty tool used for shaping poles, removing bark from tree limbs, and removing branchlets from tree trunks and larger branches. It is a rough work tool, giving the user the ability to remove a lot of material quickly. When rough cutting is needed, such as when shaping logs for a log cabin or a handle for an ax, the drawknife is a quick and easy way to work. Sometimes the drawknife is used to cut into a branch and then twisted, allowing a strip of wood to be broken off. While one has to be careful doing this so as to not bend the knife, fairly good sized strips can be cut off at one time. The spokeshave is to the drawknife what the plane is to the chisel. In both cases, the blades of the tools are rather similar. The main difference is that the spokeshave and the plane have a shoe or foot, which provides extremely accurate depth control and finer, thinner cuts. This difference means that the spokeshave will give you a much finer finish than the drawknife. 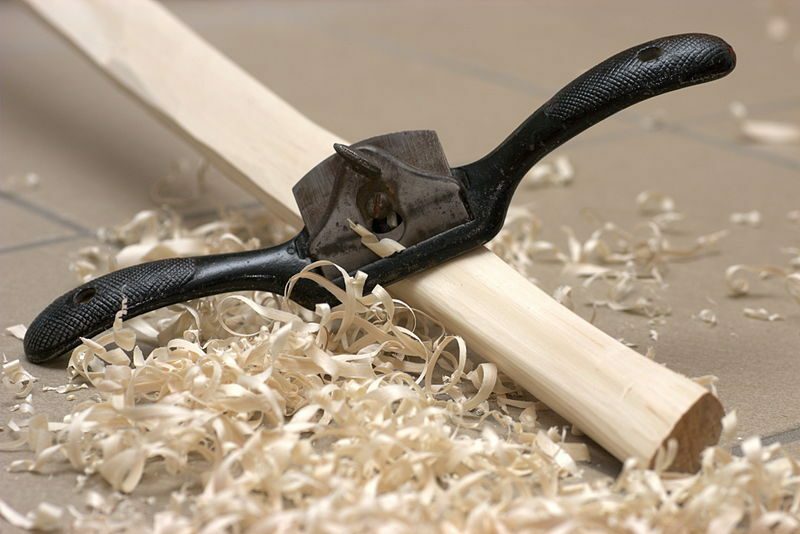 If you are making something which requires a good finish, such as the spokes of a wagon wheel (hence the name) or the legs for a chair, you might start out with a drawknife but then switch over to a spokeshave to do the finishing work. The froe is a longish blade mounted at a right angle to a handle. This allows it to be used with a mallet for splitting wood – not splitting it for the fire but splitting it to make boards or shingles (think cedar shake shingle roof). You rarely see this tool used for anything today, but you can still buy them and find them in antique stores. 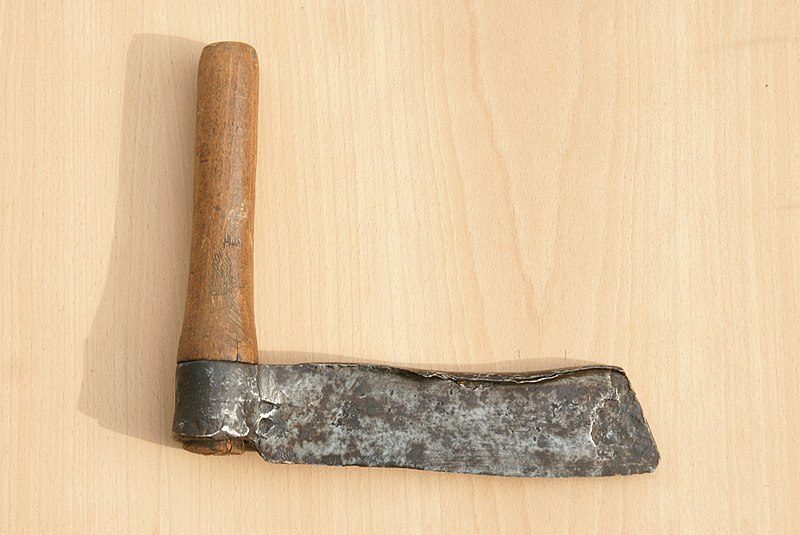 The adze can be considered to be an adaptation of the ax, even though it is used quite differently. While the blade on an ax is parallel to the handle, the curving blade on an adze is perpendicular to it. This allows it to be used in a backhanded scooping motion and makes it excellent for shaping logs and timbers. 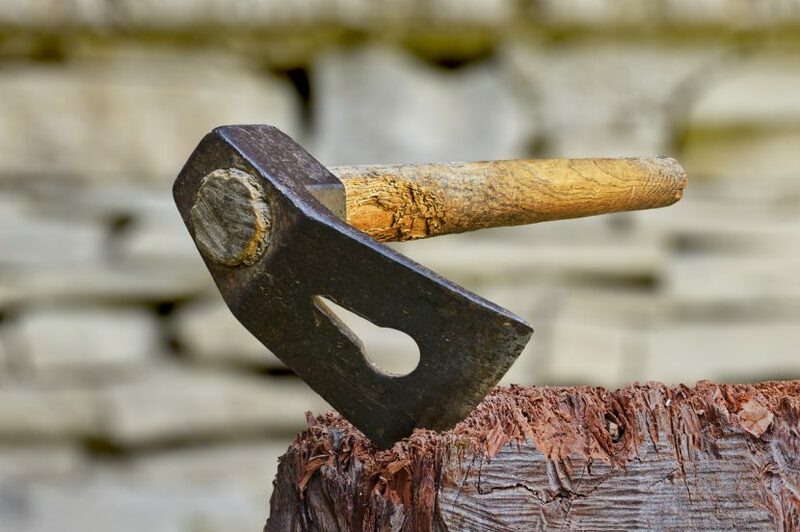 If you were to make a squared log home or to try and make a wooden sailing ship by traditional means, you would spend a lot of time working with an adze as its main use was for squaring logs into timbers. If you can find an old building with hand-hewn timbers, you’ll notice that the surface of the timber is rough and looks like it had been scooped out. This was done with an adze. A number of the worst potential disasters that people talk about involve the loss of the electric power grid. Should that happen, all our power tools will be worthless. Oh, you might be able to charge your batteries via a solar panel, but it’s going to take a couple of days of charging. If you have a lot of work to do, you’re going to need more than that. 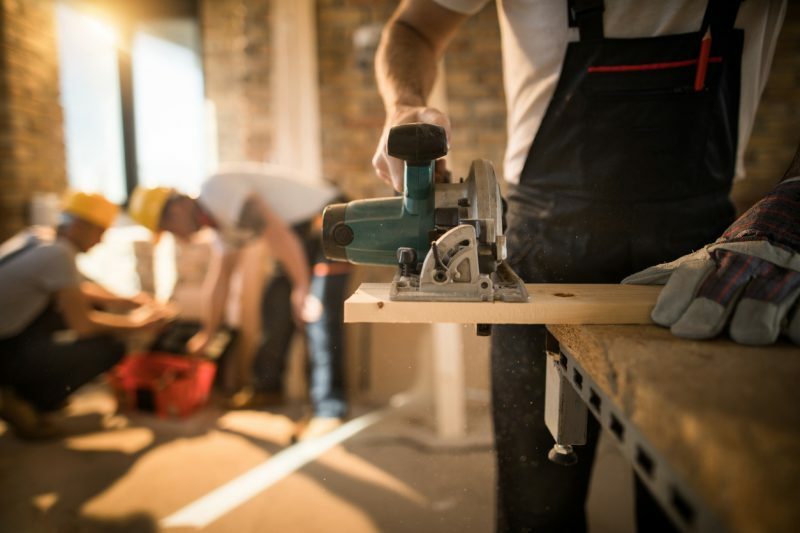 Knowing how to use these manual tools, and others, would allow you to build a cabin in the mountains or make emergency repairs to your home without electric power. Besides that, it’s fun doing woodworking the old-fashioned way, even if it does take longer.